Wouldn't it be cool to put on an old leather jacket that's been worn, torn and sweat-baptized by your favorite rock 'n' roll god? Well, assuming you can afford it, you'll soon have your chance—or at least your wrist will. In mid-November, boutique wristwatch and accessories brand Nixon will begin releasing its Rock LTD Collection, a limited-edition issue of watches featuring leather straps crafted from items donated by the likes of Pete Townshend, Tom Waits and Ozzy Osbourne, to name a few. Proceeds from the watches will go to the MusiCares MAP Fund, a charity administered by the Recording Academy that provides addiction recovery treatment to members of the music community. "These artists have a deep commitment to finding ways to support others that are struggling with this illness," MusiCares vp Dana Tomarken told Adweek. "They may have been in a position to fund their own recovery, but how many people can? It says a lot about their commitment that they help us generate money that can save others' lives." Ask Ozzie. "I know firsthand about the ravages of addiction," Black Sabbath's former frontman said in a statement. "I also know that the MusiCares MAP Fund is a vital safety net for people in the music industry." With watches priced between $1,000 and $4,000, the charity can expect a handsome haul. 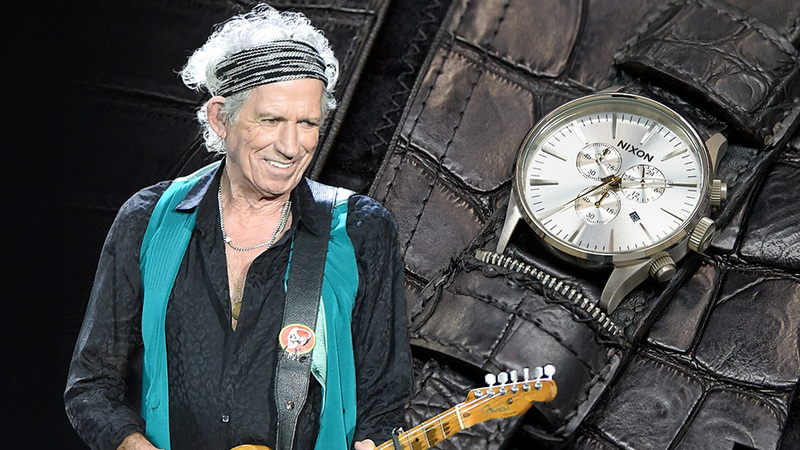 Nixon's leather craftsmen will take just about any item an artist is willing to give up—The Rolling Stones' Keith Richards donated a leather jacket; Tom Waits parted with an old pair of boots—and then harvest enough leather for the watch bands. It's a time-consuming process that reverses the usual thinking when it comes to fine leather accessories: In this case, the more beat-up the leather is, the more desirable. "It's always better to get a well-traveled leather jacket than one right off the shelf," said Nixon co-founder Chad DiNenna. "We'll try to find unique elements, such as the buckle on Tom Waits' boot. Those are the pieces that make them really original, rare and captures the spirit." The job of ferreting out the donations falls to MusiCares' Wynnie Wynn, who's well networked within the rock 'n' roll community and says that most of these aging road gods are happy to accede to her request for old leather. "It's nice to reach out to an artist and not ask him to perform," she said. Instead, all they have to do is reach into the closet to produce an item that can raise significant funds. "They enjoy it," Wynn said, adding, "whatever they choose to give us, Chad will make it work. Ringo gave us a piece of leather from his drum bag. Eddie Van Halen gave us a used guitar strap." Some artists, like The Who's legendary axeman Pete Townshend, toss in a little something extra. "Pete allowed us to put the Who's logo on his watch," Tomarkin said, "which is quite remarkable." "Making music is easy and usually enjoyable. Dealing with commercial success or failure and the way it impacts family life is tough," Townshend said in a statement. "That's my story. I support the MusiCares MAP Fund because they try to help musicians of all kinds recover from addiction." Rock LTD watches will be sold worldwide at selected retailers including Fred Segal, Barneys and Selfridges. (Heads-up, superfans: It means waiting in an old-fashioned line, since nothing will be sold on the Web.) 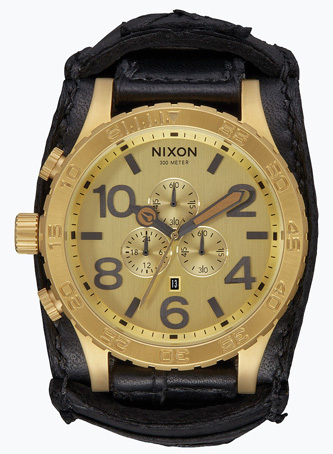 Nixon numbers each watch and includes a certificate of authenticity in the accompanying box. Quantities are, as one might expect, incredibly limited. Nixon's products have enjoyed longstanding popularity in the music world, and the company itself takes no profit from the Rock LTD line; the mere association with the Recording Academy and with stars of this caliber is apparently enough compensation. 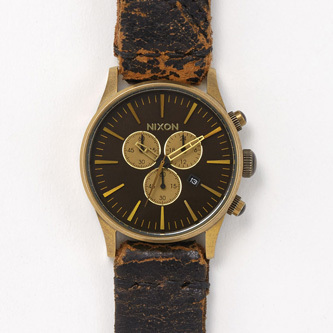 Several years ago, Nixon began making its straps from leather jackets it found in Southern California thrift shops. "It was Dave Grohl who first introduced us to the Recording Academy's MusiCares MAP Fund," DiNenna said, and his company has periodically produced limited-edition watches for the charity ever since then. "These are unique, one-of-a-kind pieces that we've created out of love and respect to the artist and music," he added, "and I'd like to believe that comes across to the people who purchase them." Who does purchase them? A mix of devoted fans, friends of the musicians and even other rock legends. A few years ago, after Jeff Buckley's mother donated one of the late guitarist's jackets, Green Day guitarist Billie Joe Armstrong was reportedly spotted in line waiting to buy one of the watches made from its leather.